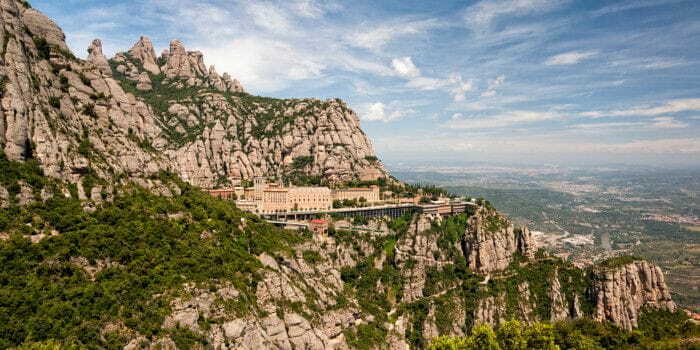 Montserrat mountain is one of the cultural, spiritual and religious symbols of Catalonia – a place where people go to see the shrine of the Black Madonna and the children of the choir singing the Virolai hymn. But Montserrat is also a natural park with its own personality: provided by the dozens of rounded needles that characterise its line of summits. Just half an hour from Barcelona, Montserrat Natural Park is ideal for discovering the natural caprices of its rock formations. Formations that are well known by the country's climbers, because, if Montseny is a Catalonian school for hiking, Montserrat is an authentic university for climbers. The great difficulties associated with the rocks of the conglomerates and the height of the needles make «the hundred-peak mountain», as described by the poet, Joan Maragall, a mythical place for lovers of climbing, via ferratas and ravines. What you may not know is that the inside of Montserrat is as spectacular as its outside. The Salnitre Cave and the Cold Cave of Collbató are two of the best known underground cavities, but there are many more you will discover, if you are accompanied by an expert guide.